The Eagle’s Nest townhomes in Crested Butte recently finished a major capital improvement project, with items such as new windows, new rock details, new roofing, and new siding significantly improving the appearance of this complex. Located on a winter-time condo bus route, access to Crested Butte Mountain Resort and town of Crested Butte is straightforward. During the summer months, a short walk is all that is required to catch the bus for a night on the town. These townhomes generally feature a garage with a laundry room and large storage room, 3 bedrooms, and 2.5 baths. With an elevated building site, the views of Crested Butte Mountain Resort are exceptional, and the units receive great natural light, especially in the morning. Other amenities include a hot tub and sauna, perfect after a day on the slopes. Eagles Nest is a great choice if you’re looking to maximize your short term rental income, but it also makes a great home for long term tenants or full time residents. Eagle’s nest is located at 31 Marcellina Lane, Mount Crested Butte, CO 81225 (lower buildings) and 11 Morning Glory Way, Mount Crested Butte, CO 81225 (upper buildings)As of 6/5/2018, there have been 8 sales in the past 24 months, at a median price of $305,000. If you are interested in buying or selling an Eagle’s Nest townhome, or would like more information, feel free to contact me anytime. 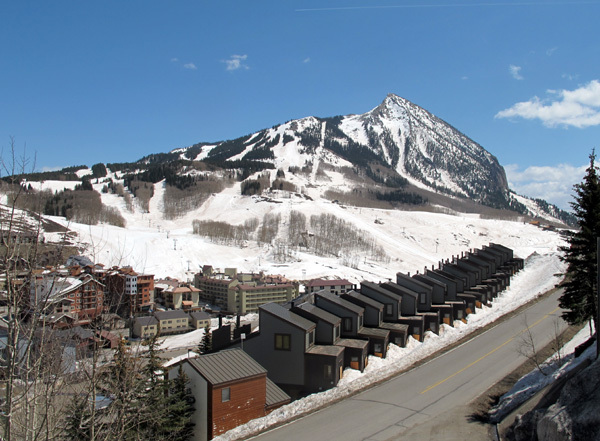 Overview, map, information, plus all Eagle's Nest Townhomes for sale in Mount Crested Butte, CO. Request a property valuation for your Eagle's Nest Townhome.